Combine all of these elements together and you have a (nearly) perfect evening. The only reason I say nearly perfect – as opposed to completely perfect – is simply because my husband wasn’t able to join in on all the fun. He had too work late (boo, hiss). But, my friend/food blogger/Blazer nerd Mari is a lovely substitute when the husband isn’t available, and we did it up right last Friday. We soaked in the sun. We watched a great basketball game. 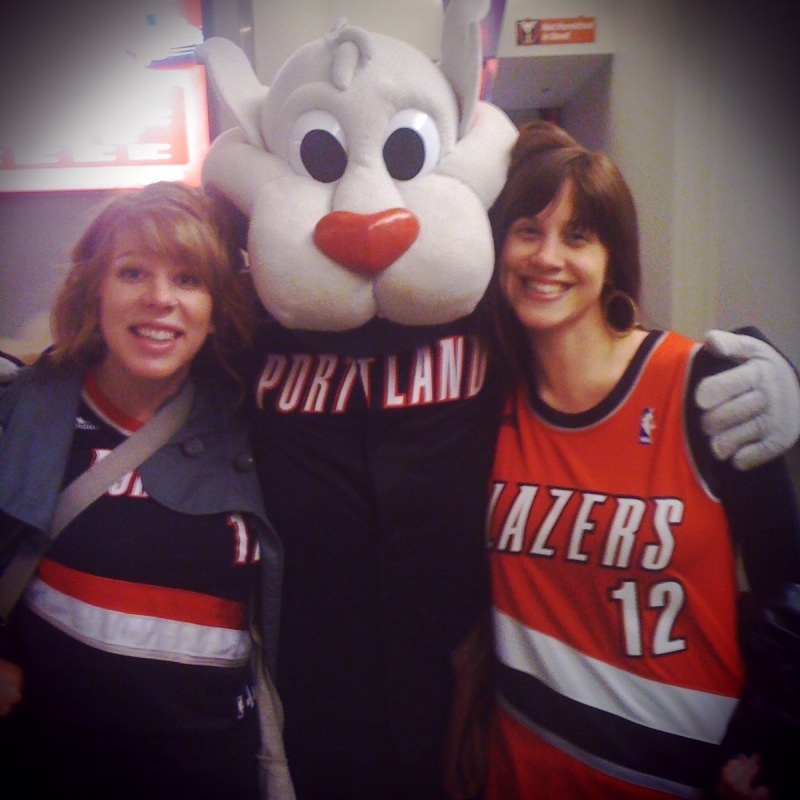 We wore our matching LaMarcus Aldridge Jerseys (like the dorks we are) and cheered on our boys. The food was fabulous, the company was superb, and the basketball game was nothing short of amazing. But, enough of this basketball craziness. This is, after all, a food blog (as opposed a basketball blog), so I feel the need to tell you about the food that contributed to our perfect evening. The chickpea pancakes are a recipe I’d seen on the almighty Tastespotting. I always keep an arsenal of Gluten Free recipes around for nights when Mari visits, and this recipe was at the top of my list. Not only was the recipe gluten free, but it was vegan (yay Lent! ), required minimal prep and/or ingredients, and it looked unbelievably tasty. 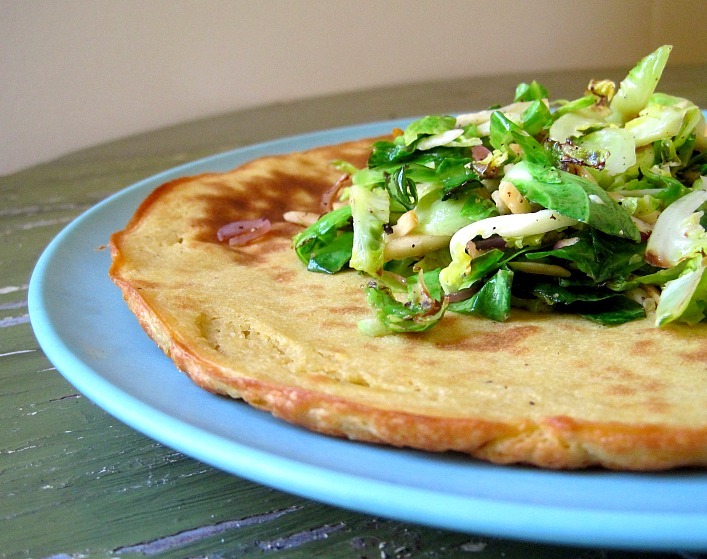 The original recipe paired the chickpea pancakes with a lovely green salad. I didn’t have the makings for a lovely green salad, but I did have a bunch of Brussels sprouts that I needed to use up. So, then, I simply made up a “salad” using the Brussels and various other ingredients I had laying about. 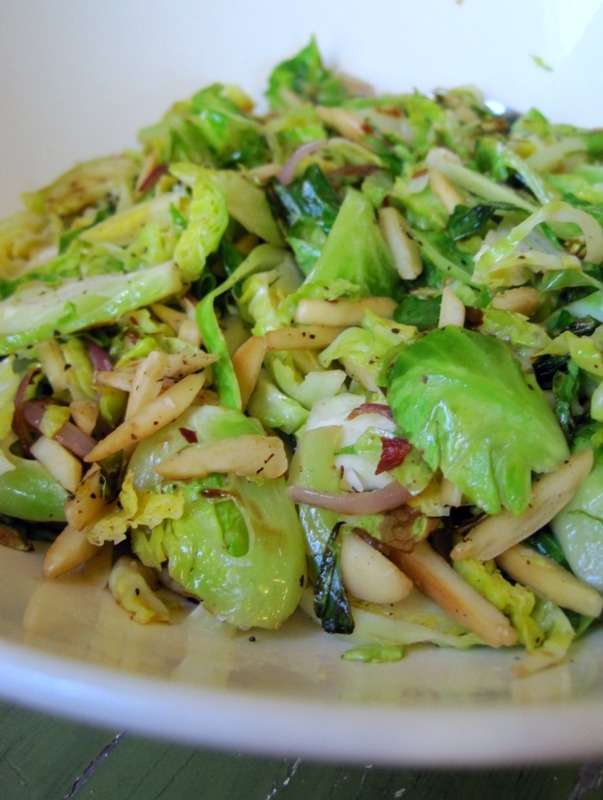 The result: a warm shaved Brussels sprout salad with shallot, almonds, and lemon. It was the perfect compliment to the chickpea pancake. I served the warm salad atop the chickpea pancake, with a drizzle of Goddess dressing over the top. Using a knife or mandoline, slice Brussels sprouts very thinly. Toast almonds in a dry skillet over medium high heat until golden brown, about 5 minutes. Be careful not to burn. Set almonds aside. In the same skillet, warm 1 tablespoon quality olive oil (or clarified butter). Add minced shallot to the pan and cook until translucent. Add in sliced Brussels, and cook for 2-3 minutes, until sprouts are starting to wilt (but are still green and crisp). Remove pan from heat, and toss the Brussels mixture with lemon juice, salt, pepper, chili flakes and toasted almonds. Serve warm. 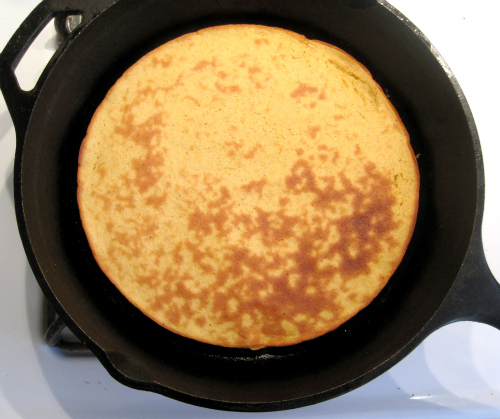 The recipe for the chickpea pancakes can be found at Whole Living Daily. Linds, I just love you. Indeed is was a (near) perfect Friday night girl date. I loved everything about it and now I’m having dreams about the pancakes and the sprouts and the dressing…and everything really. Viva la SUMMER! Can’t wait. I love every last thing about this post. The photo is hilarious and amazing, the recipe is mouth-watering, the company looks divine, there was sun involved, and… the Blazers beat the Lakers!! What a perfect post. Mmmmm… Brussels Sprouts are my favorite veggie and these look just delightful! Sounds like such a lovely evening! Yum! What a perfect night… I have had shaved b sprout salad at restaurants but never thought of making. That will soon change! Love the rose paring too. What a fun evening! Absolutely love your chickpea pancakes. Always looking for a good recipe with chickpeas as my kids just adore them. THIS is just perfect. These look so delicious. My mum used to make me chickpea pancakes when I was little (and a vegetarian) and I don’t have the recipe so will definitely be trying these. I also love brussels sprouts with chilli – great idea! wow, you make brussel sprouts sound good. and, i bought a bottle of goddess dressing yesterday and it is the best thing ever. not sure if that was what you were going for on your blog, but it makes me happy! (ps, it is “laying around” not “lying around” grammar nerd!). Once again, you make my mouth water with those tempting treats. I adore shaved brussels sprouts salad. I love girls nights too AND it’s vegan. Perfect. Sounds like a wonderful night 🙂 I love this recipe. I will definitely be trying it! !